Nacht der Untoten. Verruckt. Shi No Numa. Der Riese. These names strike terror in the hearts of anyone that dared venture into the undead playgrounds of Call of Duty: World at War. The zombie story started there. It ends on the Moon. 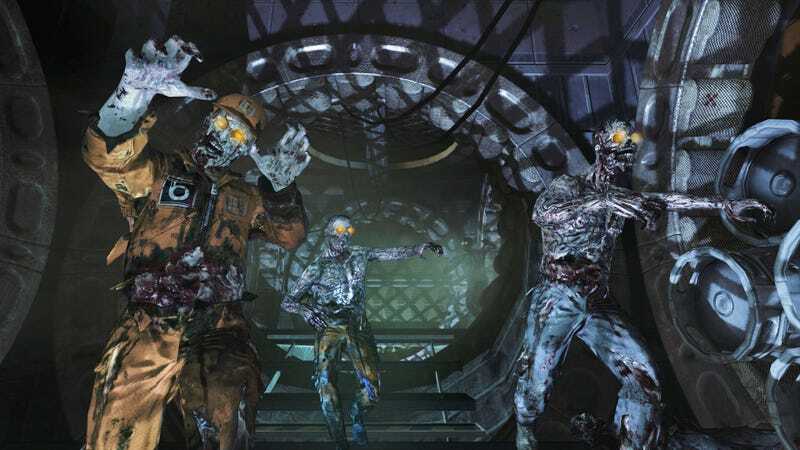 Due out on August 23 for the Xbox 360, the Rezurrection donwloadable content pack for Call of Duty: Black Ops combines remastered versions of those four classic zombie packs with a new one called Moon, for obvious reasons. Forget about heading to a remote island to escape the undead hordes; they're spaceborn now, and there's no escape. Expect high-tech weapons, bizarre new weapons, and one hell of a challenge. The five maps are packaged with an enhanced Zombies Soundtrack featuring three never-before-purchasable tracks and a special Xbox 360 Moon theme, all for the low, low price of 1,200 Microsoft points. What's that you say? You've already gotten those four maps with the Hardened or Prestige editions of Black Ops? Well fine then, you get Rezurrection for free. I'm sure the PC and PlayStation 3 players will get a similar deal whenever the content comes their way.